You may not be able to see it but it's the deadliest form of air pollution. It can penetrate deep into the lungs and bloodstream, causing heart attacks, lung cancer, and premature death. It's called particulate matter, also known as particle pollution or PM. Over the last month, I've been investigating Particulate Matter in the context of WestConnex. The results are disturbing. 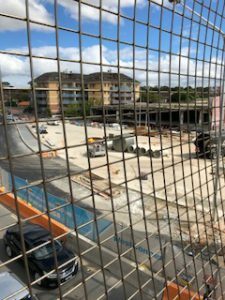 So far, this year air pollution has exceeded daily average national goals on at least 10 occasions along the route of the WestConnex M4 East, a tunnel between Homebush and Haberfield that is expected to open next year. Daily exceedances of national goals are supposed to be rare in Sydney. Traffic-related pollution – there is a huge amount of evidence that air pollution increases death from cardiovascular disease, that's the leading cause of death in Australia. It leads to increased hospital admissions from heart disease. It leads to increased stroke. It leads to increased respiratory disease, and it leads to increased deaths from respiratory disease. It leads to higher rates of low birth weight in kids. And there are major reviews by WHO that occur every few years or from groups that are consulted by them and every time one of these reviews occurs the evidence about the strength of the relationship between pollution and bad health get stronger and stronger. There's no question about this…...It's absolutely true that pollution levels for half a kilometer each side of roads are much higher than they are outside that. Pollution levels will be higher at entry and exit points. They'll be higher at stack points. But there are big measurement problems here. Watch of the video of Professor Torzillo's speech. Any exceedance day deemed to be ‘exceptional’ is not included when determining compliance with NEPM goals, while an exceedance determined to be a ‘non-exceptional’ event is (NEPM Section 18, 3C and 3D). Note that 'exceptional' is defined narrowly. A hot and dusty day in Sydney does not qualify, and does count against the goals, unless it is during seasonal burn-off, directly linked to an actual fire, or a continental scale dust storm. Westconnex M4 East and Air quality. and many other citizens and health professionals were concerned about how the project would negatively affect air quality, both during construction and after the tunnel opens. At WestConnex EIS sessions, NSW Roads and Maritime Services representatives were like a broken record, constantly reassuring residents that their concerns were unfounded. 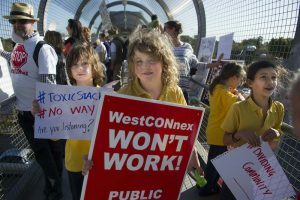 But residents and community action groups didn't trust them and submitted thousands of submissions to NSW Planning objecting to WestCONnex M4 East on the grounds of air quality. Councils' hired independent experts whose analysis found major flaws in the WestConnex EIS. In its response, WestConnex EIS dismissed construction impacts as ‘temporary' and not sufficiently significant to quantify. Temporary in this case can be as long as three years or even six years if you are unlucky enough to live in St Peters Haberfield or parts of Ashfield. This could encompass a child's first five years or his or her primary school years. It is not temporary. Nevertheless NSW Planning adopted this view. 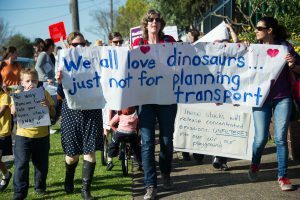 Protests in Haberfield before M4 East construction began. Photo by Lorrie Graham. The Sydney Motorway Corporation is currently operating 6 monitors along the route of the M4 East, which will open next year along with two huge unfiltered ventilation stacks. One stack is in Homebush, the other in Haberfield. NSW Planning requires the monitors to be operated for one year before the tunnel opens. The monitoring is designed to reveal the impacts of the stacks on local air quality. There are a lot of problems with this strategy, which is aimed at allaying residents' concerns. Planning does not require any monitoring to measure the impacts on residents living near the tunnel portals or of the construction impacts that last for years. 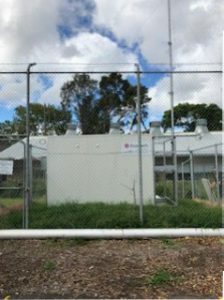 Nevertheless, the SMC monitoring is useful and provides us with a rare glimpse of air quality in the Inner West Parramatta Road corridor and evidence to use in evaluating WestConnex's environmental claims for the M4 East and other WestConnex projects, the Western Harbour Tunnel, the F6 and Northern Beaches Link. Map of monitoring stations for Westconnex monitoring site. Measuring and predicting air quality is a highly complex and technical matter but some basic points can be made. Local air quality strongly reflects broader regional air quality. It can also reflect local impacts including dusty construction sites and nearby traffic. In following the website, it quickly becomes apparent that wind direction is a strong influence at all locations. Wind changes in Sydney are very frequent and can cause readings to go quite rapidly up and down. It's important to remember that when the wind changes, it may be blowing pollution across the road or to another suburb. The monitors only measure the air quality at one particular location. The air quality may be better or worse at other locations in the area. For example, nearby trees can reduce levels of pollution. 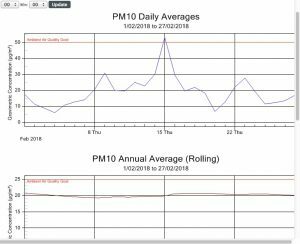 On February 15, the PM 10 daily average shot up to just over 50 μg/m3. (Some of the other five WestCONnex monitors also recorded more than 50 μg/m3 on that day.) If this was a NSW OEH site, that would be a national exceedance unless it was later classed as an 'exceptional event'. It shows the daily exceedance on February 15 but doesn't show that on February 23 around midday, the PM 10 climbed to 131 μg/m3. One of the disadvantages of averages is that it doesn't show the peaks and troughs. The data could easily presented in a way that showed the variation and still show the averages. The Ramsay Street monitor is about 100 metres west of the corner of Wattle Street and Ramsay Street. Major construction work is happening not far away. It's also near a very busy road which would be expected to get even busier when the tunnel portal opens nearby. Many trees in this area have been destroyed, including very large ones. Trees help reduce PM. The weather last Sunday, March 18th was usually hot and gusty for a Sydney autumn day. Temperatures soared across Sydney and by late afternoon the PM 10 levels were climbing. The weather was unusual but is likely to become more common as climate change progresses. At 10 pm, the air quality had deteriorated even further. By this time the PM 10 levels at Haberfield School was 260 μg/m3 and the PM 2.5 was at 23. Other sites along the route were also high. 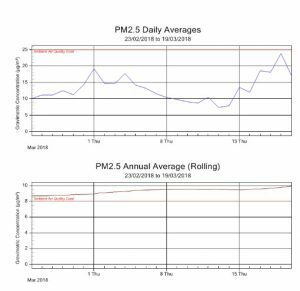 Ramsay Street PM 10 had dropped back to 239 μg/m3 but even more worrying the more dangerous PM 2.5 was 183 μg/m3 where it stayed until sometime between 10.50 and midnight. In case, you don't believe me, I took a snapshot. As I finish writing this report, it's now 9.30 pm on the evening of March 22nd. The air has cooled and it has been pouring for hours. The wind is low. The levels of PM 10 have gone down in Haberfield and elsewhere in Sydney. When I last checked at 8.10 pm on Thursday, the PM 2.5 level at Haberfield School was 10 μg/m3 and at Ramsay Street, 13 μg/m3. This is higher than other monitors across Sydney. Update: When I checked the Ecotech website at 8 am today, the PM 2.5 levels were 12 μg/m3 and 11 μg/m3. Apart from being seriously concerned about the impact of WestConnex on the health of Sydney's communities, there are several specific issues that concern me. If you start following the website, you'll find that there are quite a few negative results, mostly for PM 10. You obviously can't have negative PM. The community needs to know how these odd readings affect the overall findings and what a negative reading at one point of time means for the readings shortly before or afterward. Do these get adjusted upwards later? I contacted two industry sources who did not wish to be named. Both confirmed they are errors. One attributed the errors to intense moisture. The other said it could be moisture but could also be caused by other factors. Extremely positive results of 985 also occasionally appear and I have assumed those as errors which also need explaining. *Note: Since I published this article, I have spoken to more air quality experts who say that negative results, especially in very damp conditions, are not unusual. The levels can shoot up and down quite rapidly. But I am yet to find anyone who has found the number of very high negatives occurring persistently as on these Ecotech monitors. I later wrote this report. After this report, the negative results dramatically decreased. But at one stage there were many repeating 985 PM 2.5 results. What is needed is more independent advice for community groups grappling with interpreting air quality data.